Both as a reviewer and a fan I miss the days of cardboard promos. Digital way to deliver promos has pretty much wiped it all away when you could go on eBay or half.com and gobble up 3-4 of those no booklet CDs for $10. That was how I would personally go on genre binges, just getting several promos in the same style from the band(s) I have never heard about. Around those times, late 90s-early 00s, I had a temporary fling with Finnish gothic rock as my “relaxation music”. As Sentenced shifted in that direction, I was also happy to listen to some newly discovered Poisonblack, Entwine, Charon or To/Die/For. That fascination was over as soon as it started and I can’t say I followed those bands for more than a few albums. In the case of To/Die/For, it was actually a pair consisting of All Eternity and Epilogue, so everything between then and Cult I am a very bad source to get a reference on. 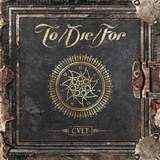 With this album some of the old founding members (vocalist Jarno Peratalo) are getting together for To/Die/For, and since I needed “relaxation” one of these days, I figured why not Cult. Well, if you hate gothic rock/metal, stay away from Cult, but if you are reading a To/Die/For review you knew what you signed up for. The leopard just can't change its spots. What you are in the market for is radio friendly music, made heavy through production, with plenty of soft melodic hooks and rock posturing. Yet, just like To/Die/For dudes are not ashamed of making these tunes, I'm not ashamed of listening to them. The soul has got to catch a break and rest sometimes, and Cult provides that opportunity. Still, with songs like In Black To/Die/For sound a little more mature, with less chug in their riffs, making the overall effort cool, loose and not strained (unlike this review). Peratalo’s voice is a lot gruffer, and definitely not as whiney, as it used to be, although the “hurt feelings” lyrical subject matter has not changed. Unknown III is a little too synthetic, and Mere Dream just feels a little unfinished, but You starts rocking agin, even if it picks up tempo at the expense of the aforementioned chug. Basically, if you are in the mood for HIM and cohorts, Cult should go over well, and you will not be noticing the noisy levels in the otherwise happy sounding Let It Bleed, the broken effects in the keyboard laden tragic dramatic End of Tears, or low drum levels and muddy guitars throughout. Hey, the melodies are catchy, the solos in Screaming Birds and You are great, piano insert in Unknown III is cool, and the vocals deliver most of the time. For some Straight Up may feel like a surprising choice to cover, Paula Abdul being not entirely metal material, and in the effort to make it gloomier To/Die/For are only making the song sillier. If you focus on the sound flaws and genre lack of weight overall, there is plenty to pick on and Cult is something you need to skip, but this album gets points for the fun and catchy factor.